Burmese pro-democracy leader Aung San Suu Kyi is freed after more than seven years of house arrest and is greeted by thousands of supporters. Nobel Peace Prize laureate Aung San Suu Kyi speaks with supporters outside her home in Rangoon, where she was released from house arrest on Saturday. 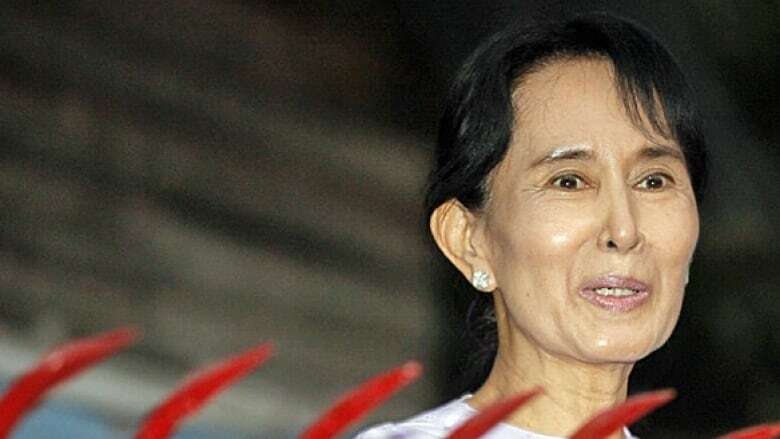 ((Soe Zeya Tun/Reuters))Burma's military government freed pro-democracy leader Aung San Suu Kyi on Saturday after her latest term of detention expired. As many as 5,000 supporters gathered outside her residence in Rangoon as she appeared at the gate of her compound. It took Suu Kyi, 65, about 20 minutes to quiet the boisterous well-wishers. She spoke briefly, thanking her supporters. "I haven't seen you for a long time," she said, adding they would see each other again Sunday at the headquarters of her political party. "If we work in unity, we will achieve our goal," she said. "We have a lot of things to do." She was expected Sunday to meet with her party, diplomats, the public and media, and to attend the funeral of a friend. She was also planning a customary visit to Rangoon's Shwedagon pagoda. 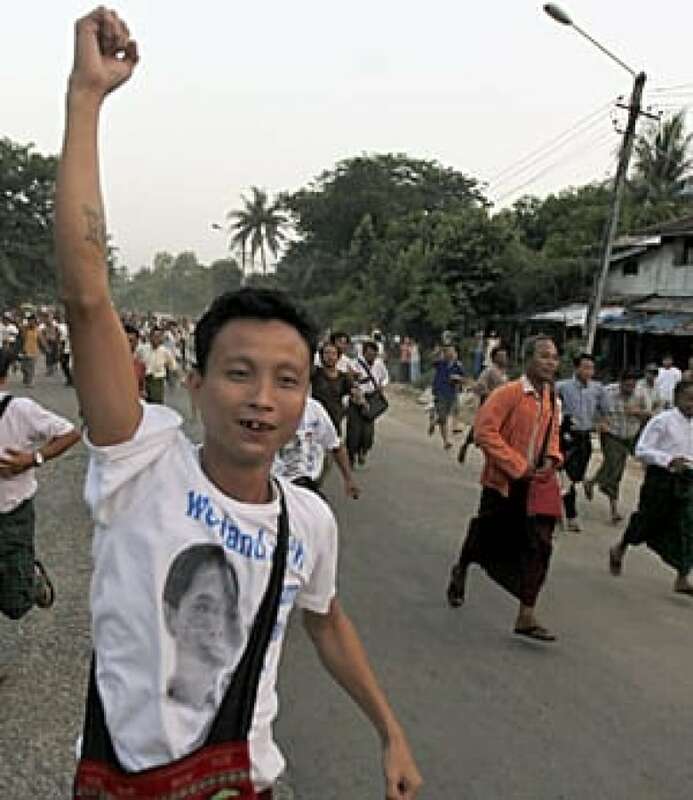 Supporters of pro-democracy leader Aung San Suu Kyi run toward her Rangoon home to celebrate her release from house arrest on Saturday. ((Associated Press))Suu Kyi has spent 15 of the past 21 years in detention without trial. Her latest period of house arrest spanned 7½ years. The 1991 Nobel Peace Prize laureate and devout Buddhist has promoted a non-violent movement for democracy in Burma, also known as Myanmar, which has been ruled by the military since 1962. The release from house arrest of one of the world's most prominent political prisoners came a week after an election that was swept by the military's proxy political party and decried by Western observers as a sham designed to perpetuate authoritarian control. Prime Minister Stephen Harper welcomed the release of Suu Kyi, calling her "an unwavering champion of peace." Canada has long supported Suu Kyi in her efforts to bring genuine democracy to the country, he said in a statement as he attended a Pacific Rim summit in Yokohama, Japan. She was granted honorary Canadian citizenship in 2007. U.S. President Barack Obama called Suu Kyi one of his heroes and a "source of inspiration for all who work to advance basic human rights in Burma and around the world." Obama said Suu Kyi's release doesn't change the fact that she and the political opposition she represents have been "systematically silenced." British Prime Minister David Cameron also called Suu Kyi an inspiration and said her release was long overdue. While world leaders are heralding Suu Kyi's release, some say the euphoria must be kept in context. "Of course it is good news," said Zoya Phan, international co-ordinator at Burma Campaign U.K. and a refugee from Burma now living in England. "We are very happy to see Aung San Suu Kyi released after seven years of house arrest, but it shouldn't be interpreted as change is on the way because we know the regime is releasing her just because of their public relations. It's not about democratic reform." Critics say the Nov. 7 elections were manipulated to give the pro-military party a sweeping victory. Results have been released piecemeal and have given the junta-backed Union Solidarity and Development Party a majority in both legislative houses. The last elections in 1990 were won overwhelmingly by Suu Kyi's National League for Democracy, but the military refused to hand over power and instead clamped down on opponents. Peter Van Loan, Canada's minister of international trade, said there is still concern over where Burma is headed politically. "The elections that we saw happen this week obviously fell far short of any standard that would be acceptable to us as a demonstration of democracy," Van Loan said at the Asia Pacific Economic Cooperation meeting in Japan. "So while her release is a step forward, we hope that this will be a first small step toward real democratization and freedom in Burma."